Have you ever felt that your life was going nowhere?Have you ever felt limited and disappointed with what was available to you and didnt know how to break free from that feeling and the circumstances? If your answer is yes, you are not alone. Many people have never felt truly alive. And, to many, life is either hard or disappointing, or running on automatic pilot. Do you know that science confirms what the ancient Masters have been saying for a long time? YOU CAN CHANGE IT. A new era begins for all of us: the era of living consciously, with full freedom to experience what we want, exactly the way we want. How is it possible to live that way? Johanna Kern explains it step by step & gives you highly effective tools you can use to live the life you want: happy, fulfilled & truly conscious. YOU TRULY ARE POWERFUL BEYOND MEASURE. YOU TRULY HAVE THE ABILITY TO LIVE THE LIFE YOU WANT.WITH NO LIMITATIONS, BUT WITH FULL FREEDOM TO EXPERIENCE WHAT YOU WANT, EXACTLY THE WAY YOU WANT. In this volume, following the book that enchanted readers and experts in North America and Europe  Master and the Green-Eyed Hope  award-winning author Johanna Kern shares the first installment of advanced level of the Master Teachings and shows you the examples of how to practically implement this wisdom in your own experience. Johanna Kern, the award-winning author of Master and the Green-Eyed Hope, transformational teacher and filmmaker, many years ago suddenly began to experience regular spontaneous trances in which she found herself in an ancient temple, where she was receiving the Master Teachings from an ancient Master. From what is the meaning of our existence, to how to achieve true Happiness, Success, Power, Abundance and Freedom of all limitations. From how our thoughts function in the field of energy that we all are a part of, to what is the meaning and nature of spirit, matter, life, death  and what really is the Wheel of Creation and who are the Citizens Beyond Time and Body. The 7 Powers described in detail in this volume can be observed externally as energies creating the world we live in, and as the internal processes we go through during our Evolution. They affect us, and our experience, at any given time  whether we are aware of it or not.This book will help you to understand your own endless potential, explain to you the mechanism of the 7 Powers and how you can use that knowledge for your benefit and growth. This volume contains among other things twelve never published before Inner Journeys to help you to expand your vision of yourself, sharpen your intuition, and induce or improve your third eye vision  which further leads to awakening some of the dormant areas of your brain. The Master Teachings of HOPE are not meant to change who you are, or change your belief system  no matter whether you come from a scientific, atheist or any religious background.They are meant to expand your consciousness and help you evolve to your full potential. There are no limits to who you can become  as there are no limits to your magnificence. You are here to be who you were meant to be. Responding to many requests, she wrote the award-winning book "Master and The Green-Eyed Hope," a recollection of her unusual professional and spiritual life adventure, including a detailed summary of the ancient Master Teachings, adjusted for the modern Mind. The book was edited by Brian Van der Horst (journalist, author, coach, therapist listed in Who's Who in the World since 1994, and Who's Who in America since 2007); and it was endorsed by internationally renowned psychologists Stanley Krippner and Jerry Solfvin. Following the success of her biographical book, and observing the enthusiastic response of the readers to her writings and teachings, Johanna Kern has designed an easy step-by-step program to improve any life situation: as a collection of CDs and the book "365 (+1) Affirmations to Create a Great Life." 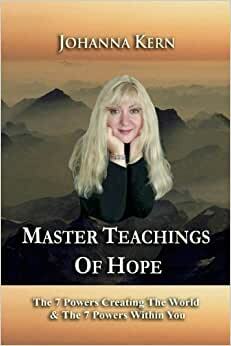 In her next book, "Master Teachings of HOPE," the author shares the first installment of advanced level of the Master Teachings and shows readers the examples of how to practically implement this wisdom in their own experience. Amazing advanced knowledge for all fans of Johanna Kern's previous books, blog posts and CDs. A complete manual showing the readers step by step how to expand consciousness and experience ourselves beyond what we are used to. The book made me understand more, feel more, accept more, and want even more such amazing advanced knowledge and skills. Fortunately, it's the first volume of an entire series - can't wait for the rest!